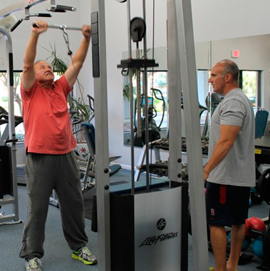 Experience customized personal training at half the cost of large public franchise gyms. Although your trainer at LIFT is the person best suited to your goals, experience, and temperament, our small size enables our entire team to follow your progress and contribute to your success. In our quiet, relaxed environment, you’re never on display like at a big public gym; you’ll rarely see more than two or three other clients during your session. We conform to your lifestyle by scheduling sessions at the times that work best for you, and with no set fee, you only pay for the number of workouts you schedule. We personalize your workout using a variety of techniques, such as Pilates, yoga, resistance bands, stability balls, and weights to ensure that your sessions are strategic, varied, and structured around your needs and capabilities.